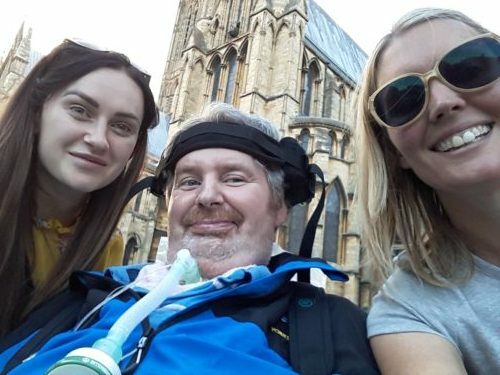 Our neurological rehabilitation centre in York has helped a man realise his dream of going on another holiday, with the help of their sister service in Lincoln. Despite enjoying regular local trips to places including York Racecourse, he has never been able to stay anywhere overnight due to the amount of equipment he requires and the two members of support staff that need to be with him at all times. That was until the team at Woodlands came up with the idea of Jonathan taking a holiday to one of Christchurch Group’s other services in the UK. They spoke to the team at The Laurels in Lincoln and decided that together, they could make it happen. Following a short period of planning and preparation of all of the equipment he would need, Jonathan hit the road and headed for his holiday in Lincoln. “I had a wonderful weekend in Lincoln and it was great to get away for a couple of days. I am deeply indebted to Clare, Emma, Norma and Vicky for their professionalism, hard work and great enthusiasm in making the visit such a success. “As the Lincoln unit is quite different it was necessary to pack a considerable amount of equipment. I would like to thank Liz, Danielle and Toni for their meticulous planning and packing. When we got to Lincoln and on the Sunday Aileen made us most welcome.